The visual style of science fiction film can be characterized by a clash between alien and familiar images. This clash is implemented when alien images become familiar, as in A Clockwork Orange, when the repetitions of the Korova Milkbar make the alien decor seem more familiar. As well, familiar images become alien, as in the films Repo Man and Liquid Sky. For example, in Dr. Strangelove, the ,distortion of the humans make the familiar images seem more alien. Finally, alien and familiar images are juxtaposed, as in The Deadly Mantis, when a giant praying mantis is shown climbing the Washington Monument. 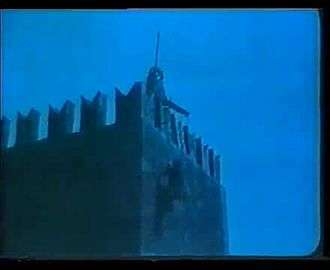 There were relatively few science fiction films in the 1960s, but some of the films transformed science fiction cinema. Stanley Kubrick's 2001: A Space Odyssey (1968) brought new realism to the genre, with its groundbreaking visual effects and realistic portrayal of space travel and influenced the genre with its epic story and transcendent philosophical scope. Other 1960s films included Planet of the Vampires (1965) by Italian filmmaker Mario Bava, that is regarded as one of the best movies of the period, Planet of the Apes (1968) and Fahrenheit 451 (1966), which provided social commentary, and the campy Barbarella (1968), which explored the sillier side of earlier science fiction. Jean-Luc Godard's French "new wave" film Alphaville (1965) posited a futuristic Paris commanded by an artificial intelligence which has outlawed all emotion. In the 1990s, the emergence of the World Wide Web and the cyberpunk genre spawned several movies on the theme of the computer-human interface, such as Terminator 2: Judgment Day (1991), Total Recall (1990), The Lawnmower Man (1992) and The Matrix (1999). Other themes included disaster films (e.g., Armageddon and Deep Impact (both 1998)), alien invasion (e.g., Independence Day (1996)) and genetic experimentation (e.g., Jurassic Park (1993) and Gattaca (1997)). Also, the Star Wars prequel trilogy began with the release of Star Wars: Episode I – The Phantom Menace, which eventually grossed over one billion dollars. During the first decade of the 2000s, superhero films abounded, as did earthbound science fiction such as the Matrix trilogy. In 2005, the Star Wars saga was completed with the darkly themed Star Wars: Episode III – Revenge of the Sith. Science-fiction also returned as a tool for political commentary in films such as A.I. Artificial Intelligence, Minority Report, Sunshine, District 9, Children of Men, Serenity, Sleep Dealer and Pandorum. 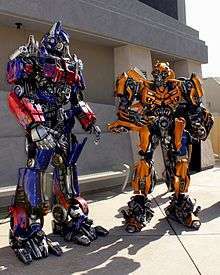 The 2000s also saw the release of Transformers (2007) and Transformers: Revenge of the Fallen (2009), both of which resulted in worldwide box office success. In 2009, James Cameron's Avatar garnered worldwide box office success, and would later become the highest-grossing movie of all time. This movie was also an example of political commentary. It depicted humans destroying the environment on another planet by mining for a special metal called unobtainium. That same year, Terminator Salvation was released and garnered only moderate success. The 2010s has seen new entries in several classic science fiction franchises, including Predators (2010),Tron: Legacy (2010), a resurgence of the Star Wars series, and entries into the Planet of the Apes and Godzilla franchises. Several more cross-genre films have also been produced, including comedies such as Hot Tub Time Machine (2010), Seeking a Friend for the End of the World (2012), and Safety Not Guaranteed (2013); romance films such as Her (2013) and Monsters (2010), and action films including Real Steel (2010), Edge of Tomorrow (2014), and Pacific Rim (2013). The superhero film boom has also continued, into films such as Iron Man 2 (2010) and 3 (2013), several entries into the X-Men film series, and The Avengers (2012), which became the fourth-highest grossing film of all time. New franchises such as Deadpool and Guardians of the Galaxy have also begun in this decade. Further into the decade, more realistic science fiction epic films have also become prevalent, including Gravity (2013), Interstellar (2014), Mad Max: Fury Road (2015), and Arrival (2016). Many of these films have gained widespread accolades, including several Academy Awards wins and nominations. These films have addressed recent matters of scientific interest, including space travel, climate change, and artificial intelligence. Alongside these original films, many adaptations have been produced, especially within the young adult dystopian fiction subgenre, popular in the early part of the decade. These include the Hunger Games film series, based on the trilogy of novels by Suzanne Collins, The Divergent Series based on Veronica Roth's Divergent trilogy, and the Maze Runner series, based on James Dashner's The Maze Runner novels. Several adult adaptations have also been produced, including The Martian (2015), based on Andy Weir's 2013 novel, Cloud Atlas (2012), based on David Mitchell's 2004 novel, and World War Z, based on Max Brooks' 2006 novel. Independent productions have also increased in the 2010s, with the rise of digital filmmaking making it easier for amateur filmmakers to produce movies. These films include Attack the Block (2011), Source Code (2011), Looper (2012), Upstream Color (2013), and Ex Machina (2015), which won the Academy Award for Visual Effects, in a surprising upset over the much higher-budget Star Wars: The Force Awakens (2015). Alien invasion — hostile extraterrestrials arrive and seek to supplant humanity. They are either overwhelmingly powerful or very insidious. Typical examples include The War of the Worlds (1953), Invasion of the Body Snatchers (1956) Independence Day (1996), War of the Worlds (2005), The Day the Earth Stood Still (2008), Skyline (2010), The Darkest Hour (2011), Battle: Los Angeles (2011), Battleship (2012), Pacific Rim (2013) and Ender's Game (2013). Telekinesis and telepathy are featured in movies like Star Wars, The Last Mimzy, Race to Witch Mountain, Chronicle and Lucy while precognition is featured in Minority Report. Robots in films are often sentient and sometimes sentimental, and they have filled a range of roles in science fiction films. Robots have been supporting characters, such as Robby the Robot in Forbidden Planet, Data in Star Trek, sidekicks (e.g., C-3PO and R2-D2 from Star Wars, JARVIS from Iron Man), and extras, visible in the background to create a futuristic setting (e.g., Back to the Future Part II, Total Recall (2012), RoboCop (2014)). As well, robots have been formidable movie villains or monsters (e.g., the robot Box in the film Logan's Run (1976), HAL 9000 in 2001: A Space Odyssey, ARIIA in Eagle Eye, robot Sentinels in X-Men: Days of Future Past, the battle droids in Star Wars). In some cases, robots have even been the leading characters in science fiction films; in the film Blade Runner (1982), many of the characters are bioengineered android "replicants" and in the film Astro Boy (2009), the leading character is a boy who became a robot. Contemporary science fiction films continue to explore social and political issues. One recent example is Minority Report (2002), debuting in the months after the terrorist attacks of September 11, 2001 and focused on the issues of police powers, privacy and civil liberties in a near-future United States. Some like The Island (2005) and Never Let Me Go (2010) explore the issues surrounding cloning. More recently, the headlines surrounding events such as the Iraq War, international terrorism, the avian influenza scare, and United States anti-immigration laws have found their way into the consciousness of contemporary filmmakers. The film V for Vendetta (2006) drew inspiration from controversial issues such as the Patriot Act and the War on Terror, while science fiction thrillers such as Children of Men (also 2006) and District 9 (2009) commented on diverse social issues such as xenophobia, propaganda, and cognitive dissonance. Avatar (2009) had remarkable resemblance to colonialism of native land, mining by multinational-corporations and the Iraq War. Lancaster University professor Jamaluddin Bin Aziz argues that as science fiction has evolved and expanded, it has fused with other film genres such as gothic thrillers and film noir. When science fiction integrates film noir elements, Bin Aziz calls the resulting hybrid form "future noir", a form which "... encapsulates a postmodern encounter with generic persistence, creating a mixture of irony, pessimism, prediction, extrapolation, bleakness and nostalgia." Future noir films such as Brazil, Blade Runner, 12 Monkeys, Dark City and Children of Men use a protagonist who is "...increasingly dubious, alienated and fragmented", at once "dark and playful like the characters in Gibson's Neuromancer, yet still with the "... shadow of Philip Marlowe..."
↑ Biever, Celeste. "Iron Man 2: How science cures Tony Stark's heartache". NewScientist. ↑ Bin Aziz, Jamaluddin (Summer 2005). "Future Noir". Summer Special: Postmodern and Future Noir. Crimeculture.com. Retrieved 17 November 2008.